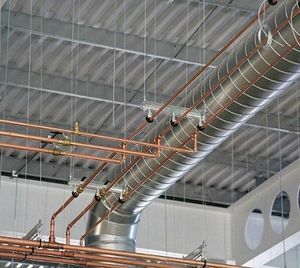 When it comes to the installation of ductwork, pipework or electrical services we are finding that instead of always using traditional support methods such as strut and threaded rod, more of our customers are considering alternative approaches in a bid to reduce costs and save time. One such alternative is using wire suspension kits, which require less steel and labour. Wire suspension kits consist of three elements; the wire rope, a locking mechanism and speciality end fixing, which can help reduce installation time. The wire rope used for such systems is strong yet flexible allowing for services to be well supported and easily hung at a variety of angles meaning they are ideal for complex projects, and can accommodate for sloped ceilings. Each of the major wire suspension brands on the market have simple to adjust locking mechanisms which allow for height adjustments to be made quickly and easily with the minimum amount of fuss. The locks can even be operated whilst wearing gloves, so there is no need to risk removing them during installation or to perform a height adjustment. Conveniently available in ready-made kits with exact wire rope lengths, specialty end fixings and locking mechanisms the kits allow for the fast and efficient installation of services. Purchasing specific kits to meet the needs of particular job minimises waste on site as well as significantly reducing the need for tools and the amount of time spent working at height. Check out our Wire Suspension ranges. Ring Anchor Fixing: designed for use in concrete and other low-strength materials, as the anchor expands when under load. Loop and Clip Fixing: for securing into concrete or concrete over metal deck, using a Pulsa P700E nail gun. Channel Nut Wedge Fixing: for fixing directly into channel. 25mm Wedge Fixing: perfect for fixing into several composite floor decking’s (R51, CF51, Holorib, MD50 and MF55). Angle Bracket Fixing: ideal for attaching to concrete, steel or wooden surfaces. Hook Fixing: a spring latch hook provides a secure connection but also allows for applications to be easily removed for maintenance. Universal Clamps: offer a clamping range without gaps for hanging ductwork or all types of pipework (replacement for pipe sizes 3/8” DN10 to 2½” DN65). All the end fixings for wire suspension kits have been designed with simplicity in mind, with the aim of ensuring significant savings in time and labour can be made on installation, as well as improving the visual impact. Of course, traditional support methods such as strut and threaded rod will still have their place but, as the emphasis for installation is on speed and making the best use of labour, we have noticed that alternative methods such as wire suspension, are becoming increasingly popular. The main brands are continually developing and diversifying their ranges in order to offer quicker and more innovative solutions for the installation of all types services, in order to help customers, overcome the daily challenges they face. Alternatively check out our Wire Suspension ranges.